We had a great chase day on this day!! It started very slowly: At the hotel in Amarillo, TX, the guides huddled up and we decided.... not to decide, because we didn't know where to go. So, we headed to Walmart to wait for the 15Z RUC and kill some time. 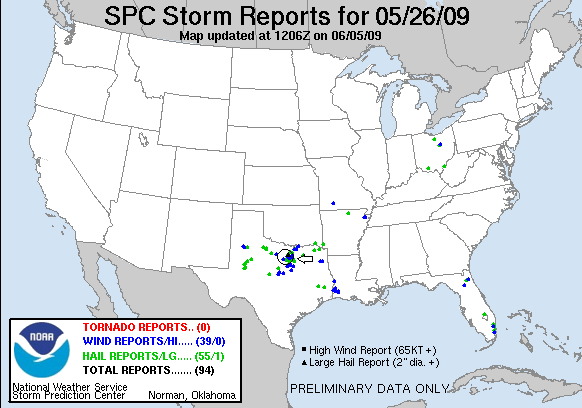 Once we saw the RUC we decided we had to get southeast regardless of which of our plays panned out: Head south to the low end of the dryline near Abilene (ironically as I typed this at 1 AM, we were getting cored at the hotel by the squall line that finally did develop down there), or near the Red River near where the surface low heading through southwest Oklahoma intersected with the dryline and a frontal boundary coming out of Kansas. We headed for Childress,TX along the same road as the previous day, but then decided to continue on to Vernon to get past the dry line which was out ahead of us. After stopping for a while in Vernon for lunch, we eventually decided to move on to Wichita Falls.... and to ANOTHER Walmart. We were there close to our target area, but while we sat there for over an hour it became clear that the area was heavily capped as the cumulus field above us began to shrivel and die. We decided to get south where a couple of storms were percolating when a bomb exploded to our southeast near Weatherford, TX, which just happened to also be the location of our hotel for the evening. We waited for a few scans to see if the storm would indeed survive, and when it did, we went after it though it was about 100 miles away. 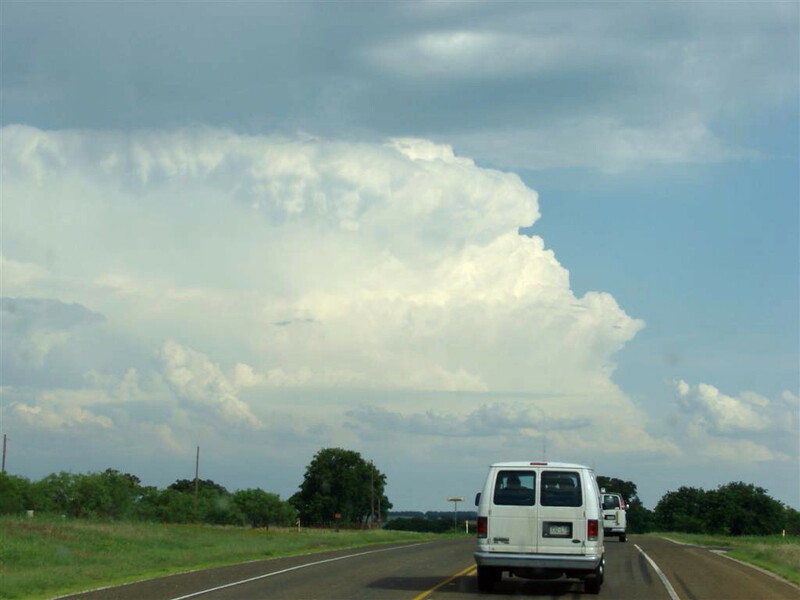 As we approached, the storm pulsed a couple of times and looked like it was going to die, but we continued on and there were several hail reports over Weatherford. 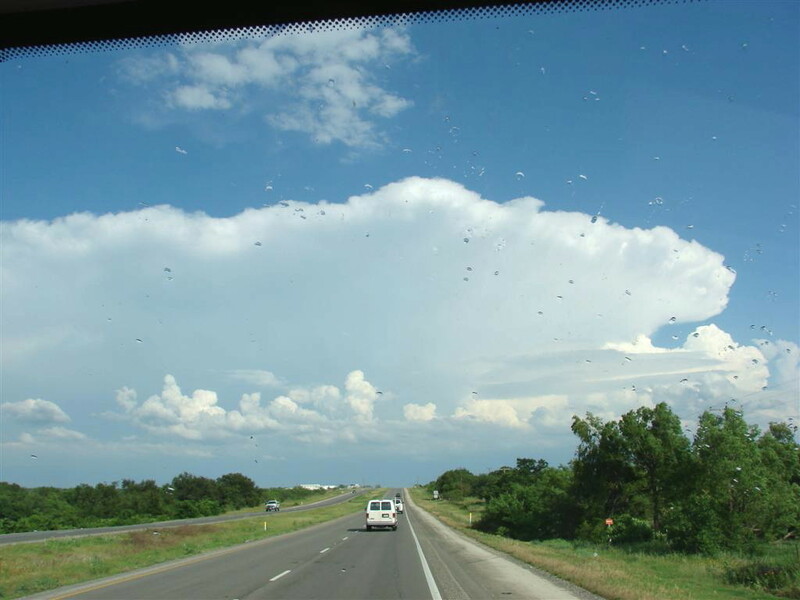 Our biggest challenge was that by the time we got there the storm would be right over the Dallas Metroplex highways and we would have to try and punch the core on the interstate near Ft. Worth. Shortly before we got there, the storm split into two discrete segments, then the southern of the two, which was our target, merged with a cell that had formed on it's flanking line and got very intense. Despite Roger's screams that we would not wreck the rental vans in a big hail core, we went charging in! The noise was deafening as we got blasted by copious amounts of nickel and quarter sized hail with a few ping pong and golf ball sized stones thrown in for good measure. The biggest problem was the idiot drivers who all tried to jam under bridges and stop, leaving so little room that the highway came to a complete halt at each one and we sat there getting pounded while we waited our place in line to get moving again. 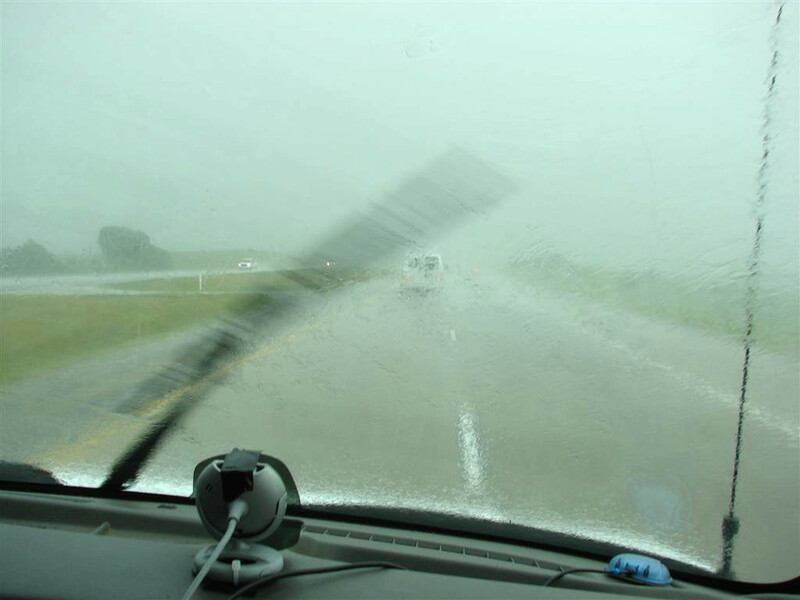 Luckily we ended up with only a few dents on the vans and no blown out windows so we continued on. Finally, we got through the core and stopped for a few minutes to look back at the storm and also regroup. We also reviewed the radar which revealed that the cell we had just punched was turning into a multicelled blob of mush, while the northern cell appeared to now be an anti-cyclonic supercell headed northwest! We decided to blow off the storm we were on and plow north to intercept. As we headed the 30 miles north towards the new cell, we went under some outstanding mammatus clouds from the southern cell. Meanwhile, the northern cell had become a very strong low precipitation supercell with a persistent 75 kg/m2 VIL core. As we approached Rhome, TX, the structure was absolutely stunning so we decided to stop about 10 miles away and video and photograph the storm. 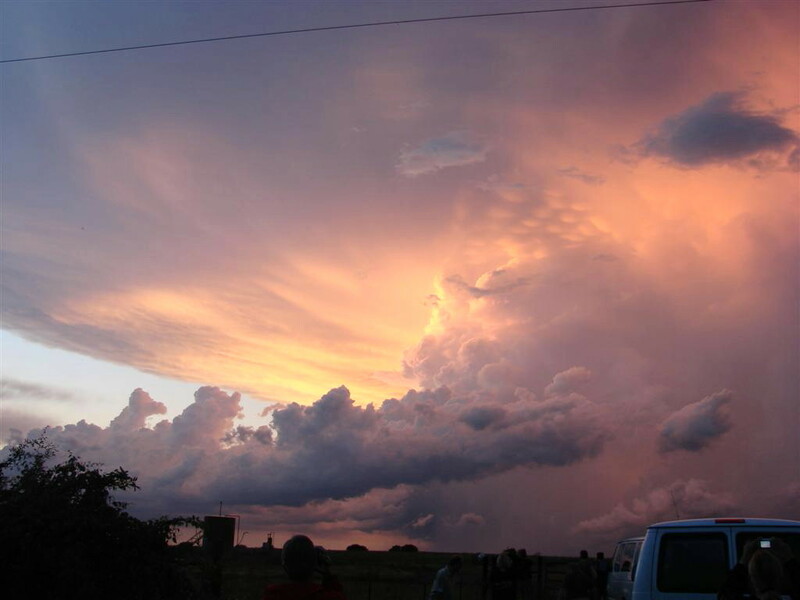 It was one of the most beautiful storms I’ve ever seen! 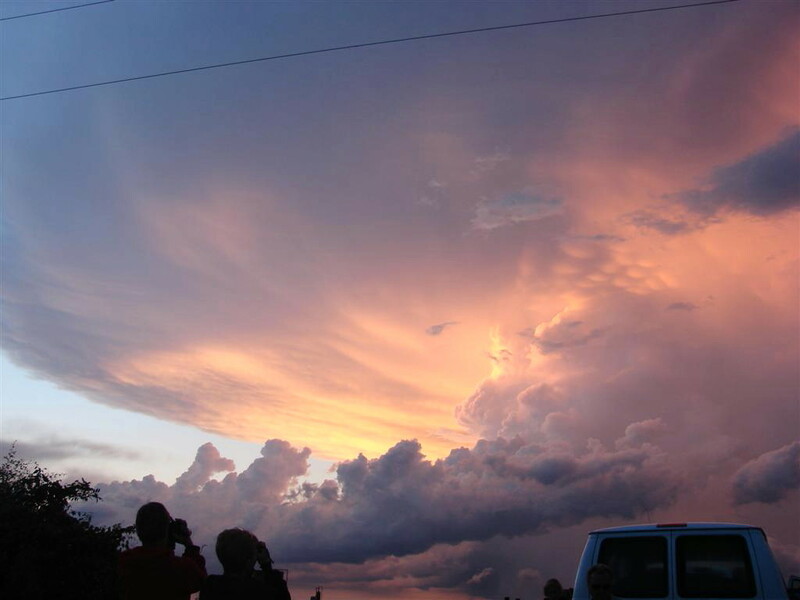 We sat there for about 1/2 an hour as the sun set and the lightning rolled up and down the updraft while we filmed away. Better still, we were only 35 miles from the hotel! We eventually gave up the chase, ate dinner in Decatur, TX, and went back to the hotel, only to get cored by the line of storms that came up from our second target area. We spent the night in Weatherford, TX with the expectation of targeting the area between Midland, TX and Ft. Stockton, TX the next day. For video of the lightning show, click here. Total mileage for the day was 481 miles. Initiation!! We head south out of Wichita Falls, TX as a storm fires to our southeast. Nice structure as we charge towards the storm. 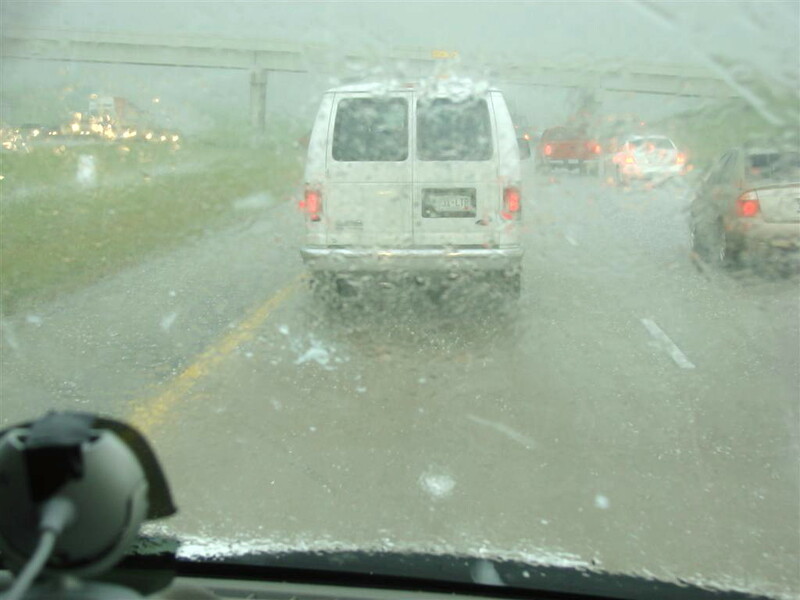 Now on the loop highway around Ft. Worth, we plunge into a major hail core in the middle of the commute! Nickel and quarter sized hail plink the van with the occasional "wonk!!" of a golf ball sized stone. 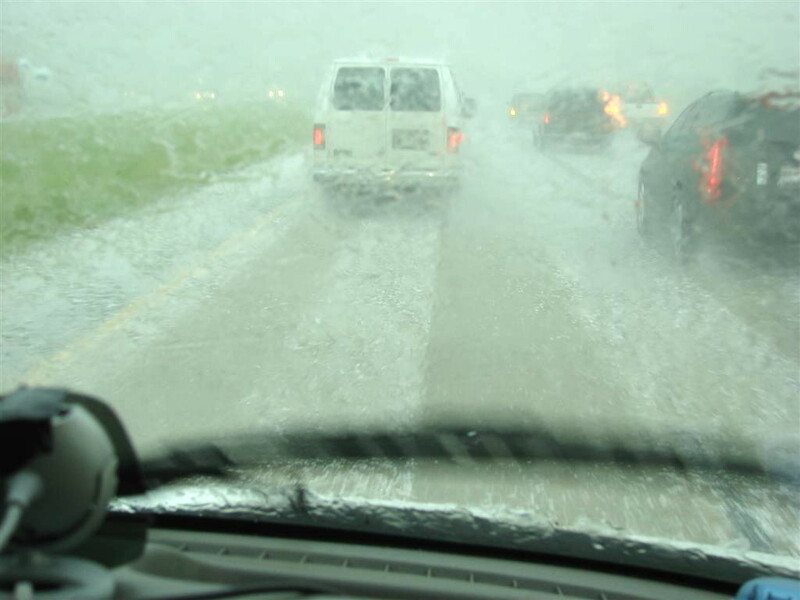 Hail begins to cover the highway as traffic comes grinding to a halt. 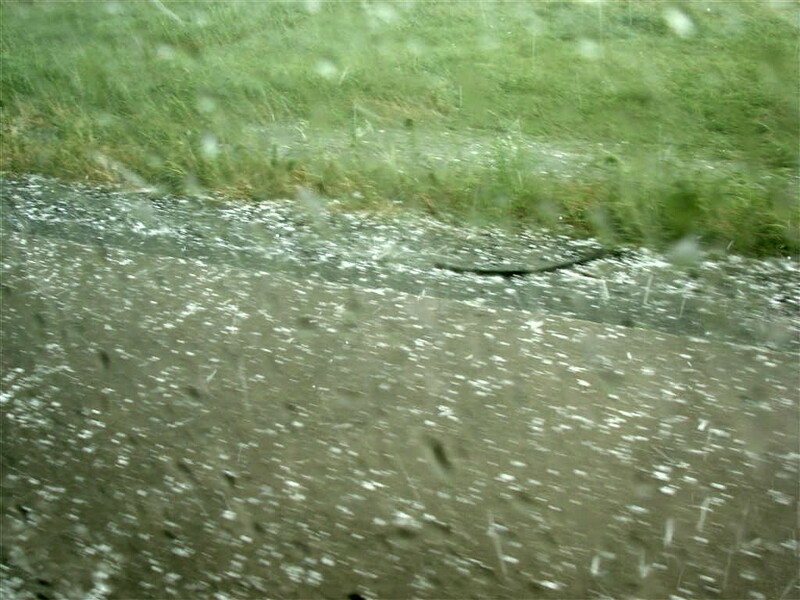 More hail on the ground. Now clear of the core, we stopped for a moment and took a look back at what we'd came though. 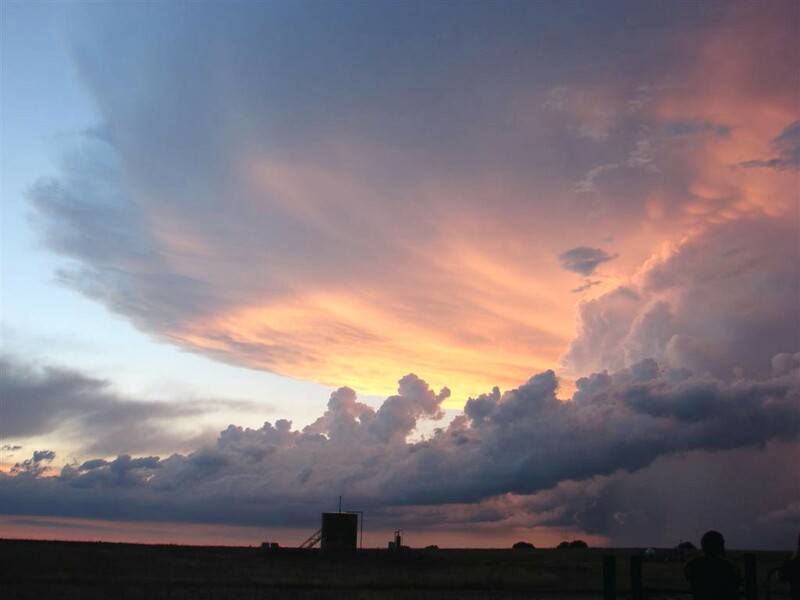 The cell was quickly weakening at this point. 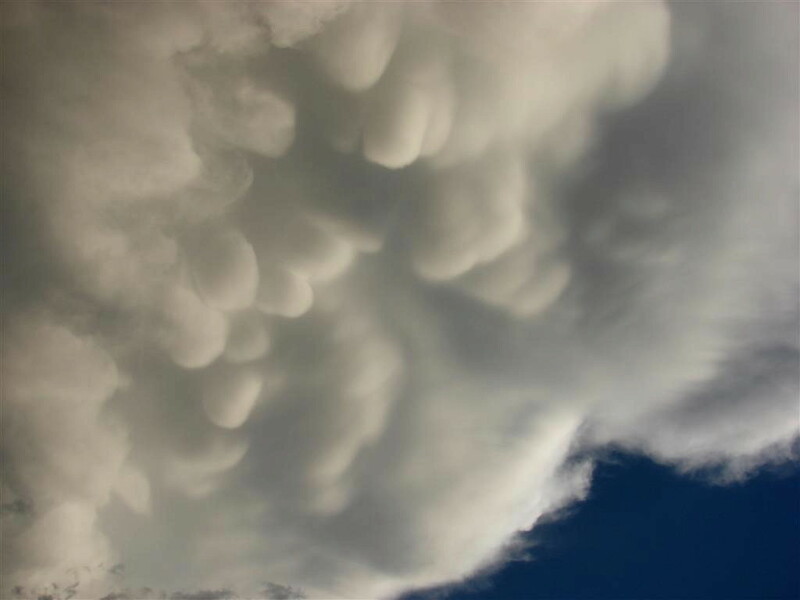 As we charged north towards the much stronger left split, we traveled under some beautiful mammatus clouds. 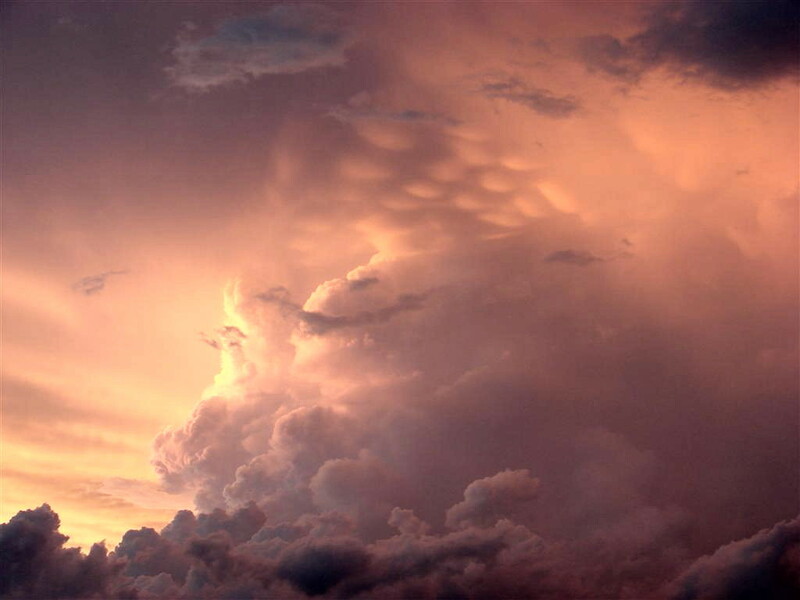 A closer look at the mammatus. 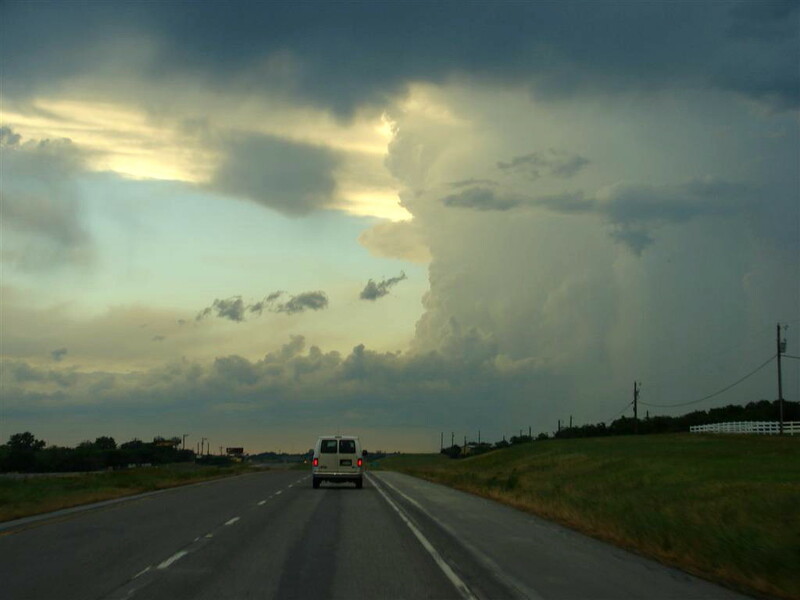 Blasting north to Rhome, TX, with the rock-hard updraft of the storm right in front of us. We elected to stop about 10 miles short of the updraft because it was getting dark and the structure and colors were awe inspiring. Closer look of the mammatus at the edge of the updraft. Twilight falls and it is time for the lightning show to begin. The next several shots are lightning in the core as it got dark. 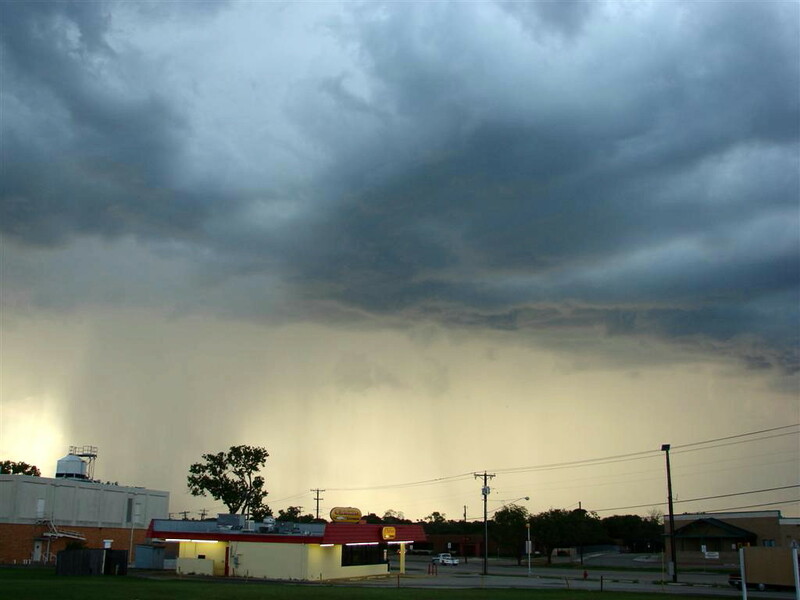 I've also got a few minutes of footage of this storm on the 2009 main page. Cloud to cloud lightning illuminates the night.